Happy Saturday! The family + I are heading out today for a 3-day weekend in Dallas. Six Flags Over Texas + Texas Rangers Baseball + Shopping + Good Food. All the things my little family needs to 'reset' and reconnect to each other. Back in High School I was an Foreign Exchange Student to Russia. Some say this is where I picked up my wild streak, that lasted well into my adulthood. Anyway. Going into Moscow and seeing the Kremlin + Red Square was an awesome experience. At 16, I didn't appreciate the history and the pure awesomeness of it all. Looking back now, though, wow. This page will end up going into my travels album. Honestly, I haven't scrapped hardly any of my Russia, Germany and Ukraine photos. Back when I was there, I wasn't into taking great photos so many are, shall we say, craptastic. But I am going to use them anyway! 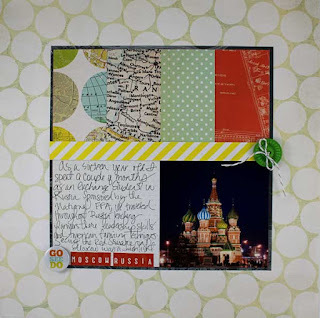 I will be linking this page up to the Paper Issues Blog, for their Abroad Challenge. Today's the last day before a new challenge goes up tomorrow. Have you played along yet?